Call us at (304)-727-5237 today. 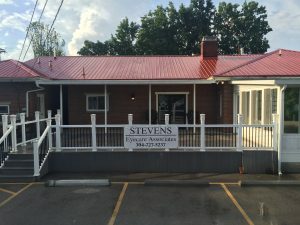 Welcome to Stevens Eyecare Associates PLLC in Saint Albans. Dr. Nathaniel S. Stevens and the Stevens Eyecare Associates PLLC team strive to provide the best in optometry services. We invite you to browse our website to learn more about our optometry services and join our patient family by scheduling an eye exam appointment at our Saint Albans office. Come see us at our newly renovated office at 907 6th Avenue, less than a half a mile from our previous location. A private, paved parking lot and entry is in the rear of the building via the alley. We are accepting and enjoy seeing new patients! Our practice grows from the kind words of people like you and we greatly appreciate your referrals. As a way to say "thank you" for your referrals we will send you a $10 coupon to spend on materials in our office for every new patient that makes an appointment. Our experienced eye doctors offer comprehensive vision examinations at our St. Albans optometry office and specialize in the diagnosis and treatment of a wide array of eye diseases, conditions, and problems. We use advanced diagnostic technology and vision correction products and are committed to improving the quality of life of persons in the St. Albans community through enhanced vision. Give yourself the gift of clear vision – schedule an appointment with your eye care provider today.